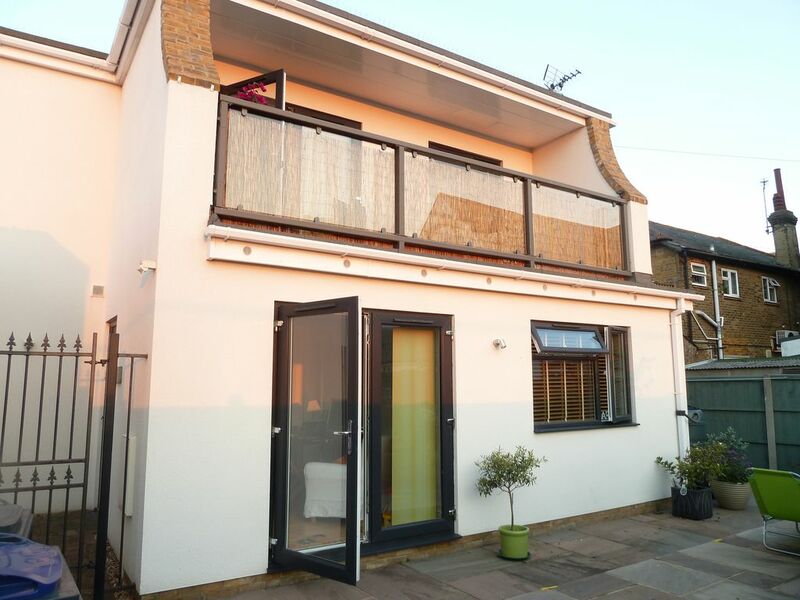 A lovely, modern, seaside house just 50 metres to the seafront and less than one minute from all amenities, yet tucked away from the main road. The property benefits from 3 parking spaces, 2 bathrooms, 2 balconies - one of which is SW facing - and a small patio garden. Furnishing is contemporary with good quality beds, 2 showers, a bath, fully fitted kitchen including a washing machine, microwave and dishwasher. The master bedroom has a comfy king sized bed with an ensuite shower and toilet. The second bedroom has 2 single beds that can be pushed together to make a super-king sized bed. The family bathroom is right next door to this bedroom and has a bath, shower and toilet. Both bathrooms have heated towel rails and there is also a washing line outside if you need to dry your washing or wet towels. Next to the house are 3 tennis courts, the Marine Hotel, a micropub, beauty salons, gym, a dispensing Pharmacy, 7-11 local supermarket with a post office and a variety of excellent takeaways and cafes. So you don't have to go far to have everything you need but just a 15-minute walk along the seafront will take you into Whitstable town centre with its quaint working harbour, craft huts, galleries, seafood restaurants, specialising in Whitstable Oysters and many independent shops. A bus stop is located nearby for travel to Whitstable, the historic town of Canterbury and Herne Bay. Whitstable train station, with regular trains into London (just over an hour's journey), is a 5-minute drive or 15 minutes walk away. Tankerton is well-placed to be near to Whitstable, yet away from the hustle and bustle of the town. Tankerton Slopes is the site of many local festivals such as the annual classic car show, Oyster Festival food fair and the weekly Park Run. Please note that Windjammer Cottage is an 'upside-down' house. The kitchen and living room are upstairs and open plan, maximising the lovely light that floods into the property. Although not suitable for people who can't manage the stairs, the house has a large hall downstairs with 2 armchairs that may be used as a second living area if required. Please note that if you have small children, the house has 2 balconies and stairs. We have enjoyed many happy times at Windjammer since we purchased the property as a holiday home just before we retired from running a small software company. We are from Nottingham and Reading, currently both living in London but we love the area so much, we are planning to move there permanently soon. Hugh went to Kent University many years ago and we often travel this way to see friends. We knew immediately that this was the right property for us when we saw it bathed in red during a sunset. The SW facing balcony is perfect with a glass of wine watching the wonderful Turneresque skies. Carol is passionate about art and has been very inspired by the local coast line and glorious sunsets. Hugh particularly enjoys the annual Whitstable Classic Car Show, which is held right on the door step on Tankerton Slopes. Everything is so easy here with the sea and shops just a minute away and there is something to suit every interest. There is a strong community spirit and the locals have been very welcoming. Family bathroom includes a toilet, bath, shower attachment and heated towel rail. The ensuite bathroom has a toilet, a large shower and heated towel rail. Full gas fired central heating with thermostatic valves in all rooms. There are 3 parking spaces; one at the front of the property, one inside the gated garden and one just outside the gates within the pebble stone area. The spaces are suitable for cars only. Open plan living room with French doors onto twin balconies. Good sized Kitchen with seating for 4+ people. 43" terestrial Freeview LED Internet-enabled TV in Living room, with stereo amplifier/speakers. Aerial connections in Bedrooms 1 & 2. The small garden area has flower beds, set in a paved area with bench and additional outdoor seating. The property is adjacent to 3 council run Tennis Courts available for use all year round. Book courts in Emm Gee Sports 124, Tankerton Road or The Lounge opposite the house on a Sunday. The property is not accessible for a wheelchair as there are stairs. The bedrooms and bathrooms are downstairs, kitchen and living room upstairs. The hall downstairs is a good size, has 2 armchairs and could be used for extra living space. However, the bathrooms are not large enough to accommodate a wheelchair. Ideal for Tennis Players and people who like to have the sea and amenities all within a short distance. Carol and Hugh’s house is a charming place for a family of 4. We really enjoyed the living area upstairs with all necessary equipment. Sleeping rooms and beds are very comfortable. The house is located in a quiet area right next to the Main Street and the Beach with easy access and parking. On top of that Carol and High were really caring. A very good choice if you want to discover the Whitstable/Margate/Canterbury area. Canterbury, Historic City Centre, Cathedral & Shopping.